From the old but interesting news file . 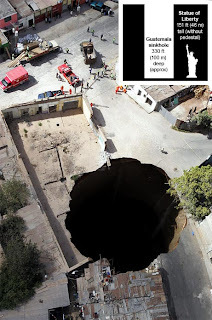 . . the picture above shows a massive sinkhole that appeared in the middle of Guatemala City earlier this year. It swallowed a dozen homes and (very sadly) took three lives. As the graphic shows, it's twice as deep as the Statue of Liberty is high. I've done a little research and it seems that, to this day, no one knows what caused it. That's weird, because you'd think that construction workers and such would know a catastrophe like that would happen and avoid building on that area in the first place. Want to See the Blog Without the Frame?